J'ai eu la surprise de voir qu'elles sont sorties cette semaine ! Mais je ne trouve aucunes informations dessus. Si vous avez quelques choses, ça serait cool. Dernière modification par Eyeshield21 le 03 nov. 2018, 10:09, modifié 22 fois. ® 2018 UDC. 5830 El Camino Real, Carlsbad, CA 92008. All rights reserved. Printed in the USA. ® 2018. ® EUROLEAGUE PROPERTIES S.A. All rights reserved. EuroLeague logo with words Turkish Airlines EuroLeague. This pack contains an assortment of 2017-18 Turkish Airlines EuroLeague trading cards. Randomly inserted into these specially marked packs are the following subset cards: Autograph Parallel (1:3.5), Exclusives Parallel (#'d to 100), High Gloss Parallel (#'d to 20), Assist Kings (1:12.5), Premier Prospects (1:45). Stated odds reflect an average of the entire production run; no ratio is guaranteed to exist within an individual box or case. NO PURCHASE NECESSARY to enter or win an insert card. To enter without purchase, go to sports.upperdeck.com/npn and provide, where requested, your name, e-mail, complete mailing address with zip code (No P.O. Box), birthdate, and day/evening telephone numbers with area code. Upon receipt, your name will be entered to win an insert card. Must be age of majority and at least 18+ years of age or over to enter. While quantity last. Limit one (1) entry per household. Failure to comply will result in a disqualification of your entry. For details about, go to sports.upperdeck.com/npn. Open to legal residents of the United States and Canada, except for residents of Florida, New York, Rhode Island, Puerto Rico and Quebec. Les fans de Nando vont avoir de quoi s'occuper un peu. offers some of the best players from the top-level European basketball league. to the online Upper Deck ePack platform. and a title in his final Euroleague season. and High Gloss (#/20) parallels that can be obtained in physical form. These average 1:3.5 ePacks and include Doncic. but these were not added until a year after the set first released. and nine-card Premier Prospects (1:45 packs). a reason to build the base and insert sets. earn the Assist Kings Achievement card for Thomas Heurtel. three other limited autograph achievements. to tackle the entire base Exclusives parallel. parallel get a Triple Autograph Achievement. High Gloss base parallel can redeem the Quad Autograph Achievement card. 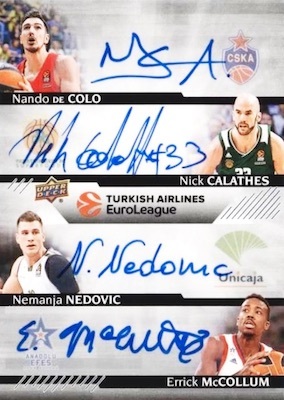 2017-18 Upper Deck Euroleague High Gloss Autographs #100 Nando De Colo.
9 digital cards plus one physical autograph achievement. 1:45 ePacks.